Berlin Orchards began 50 years ago as Chedco Farm owned by Mr. Charles Cotting. In 1986, Mr. Barry O’Brien bought the farm and began increasing the production of apples, pears, and peaches. 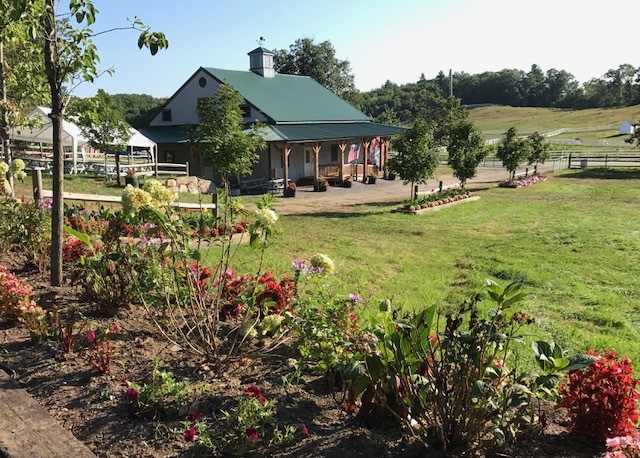 In 1995 Mr. O’Brien changed the name of Chedco Farm to Berlin Orchards to honor the town and the 200 acres of rolling hills that make up the orchard. At that same time, Mr. O’Brien built a large farm store and increased production of the fruit and vegetables grown on the farm. Gerard Beirne began farming at Berlin Orchards in 1994 and has managed the growth of the fruit since then. Since 1995, Berlin Orchards has been known for its wide variety of delicious apples and its beautiful rolling hills. Although the farm store was sold in 2006, Gerard and Sheila bought the orchard land and continue the great tradition of growing quality fruit and providing his customers with a wonderful family experience of picking apples in a quiet and serene atmosphere; just like the way it was years ago. We love farming and the orchards and we want our customers to enjoy the orchards in all their beauty. Come visit us and enjoy the hay wagon ride into the orchards to pick any of our twelve varieties of apples. After you pick your apples, stop by the pumpkin patch and pick out the perfect pumpkin. Face painting and pony rides will also be available to add to the fun. We've been going here with the kids for many, many years. The family has done such a wonderful job keeping the magic alive! We love apple picking on the hillside with gorgeous views and so many delicious varieties. Of course, you have to ride the tractor. The driver makes it fun for all of us. I love the little store. There's tons of parking. It's not the cheapest way to make an apple pie, but we gladly pay the premium to help keep such a wonderful local farm in business!!! Very family friendly, sociable farm animals for petting, wide selection of apples, delicious apple products. Love Berlin Orchards! They have the best utility apples for canning. I used to go there when I was a kid and I loved it!! Now I'm older and can't get out there for a hay ride, and fresh apple cider (and pie). Is there still penny candy? I'm dating myself. I will always remember the good old days!! Always fun!!! THANK YOU! Not the cheapest place to pick apples, but they have farm animals to visit, pumpkins to paint, and their hay ride to and from the trees is just long enough to be fun. $35/half bushel. $25/peck. Website is kept up to date on varieties ready to pick. Lots and lots of trees! Berlin Orchards is our fall family tradition. We visit almost every weekend to pick the most delicious apples in a beautiful setting. This is my favorite apple orchard! It is a family owned and run business. They have hay rides to the orchard and some amazing cider and cider donuts! They have some cool play houses for the kids and pumpkins as well as animals the kids can visit. Oh, and I love their apples! Love it here! I came for the first time two years ago and loved it! It had a fun hayride, apple cider, apple cider donuts, and plenty of apples and that's all we really wanted. We came back yesterday and we had a lot of fun. I have two girls 6 and 3 and they played in the wooden houses, loved the animals, enjoyed the hayride to the orchards, and especially enjoyed the apple picking and eating! They Cortlands, Macintosh, Gala, Red Delicious, Mutsu, Jonagolds, and others and they all tasted good!! The apple cider was fresh and you can get a cup for $1, the donuts are nice a warm $5 for 6, and pumpkin painting $5 each. The bags for apple picking are $25 for the smaller 10lb bag and $35 for the bigger bag. We chose the $25 and you can fit plenty!!! I highly recommend this place for great family fun! The two little guys and I had a great time picking apples and pumpkins. Staff and visitors all were friendly. Fun hay wagon ride and the little play cabins were a hit plus the amazing cider donuts still hot in the bag-mouthwatering. This place is amazing. Softball sized apples for less than you pay in store. The fresh apple cider donuts in the red trailer behind the store are the absolute best. Beautiful orchard, great selection of apple types and in all a fabulous pick your own experience. I went here towards the end of apple picking season, yet had plenty to pick. It is a nice drive out from Boston, the place is fairly easy to get to and had plenty of parking. The hayride was fun. There is a small shop that sells amazing cider donuts, and other foods. They also have some farm animals - donkeys, rabbits etc. Really fun place! Copyright © 2017, Berlin Orchards. All Rights Reserved. Designed by Amaranth Networks Inc.